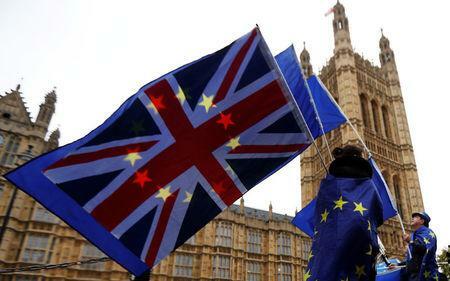 LONDON (Reuters) - British Prime Minister Theresa May's blueprint to leave the European Union emerged unscathed on Tuesday from a first day of debate in parliament on legislation to sever ties with the bloc. The debate, expected to last for weeks, is on the EU withdrawal bill, seen by May as crucial to give companies confidence that there will be no major legal changes that affect business when Britain leaves the EU in March 2019. Opponents want to use the debate to force concessions on May's plan for leaving the bloc, but the initial challenges - including on the hour and day Britain should pull out as well as on the future role of the EU court - were voted down or dropped. The prime minister will face tougher battles as the debate goes on, testing her ability to steer through a bill intended largely to "copy and paste" European rules and regulations into British law by the time it leaves the 28-member EU. Her absence from parliament on Tuesday due to other engagements suggested she was not unduly worried by the initial discussion. But the debate's ill-tempered tone showed the level of anger in parliament with a government which some lawmakers say is mounting a power grab to force through its plans. With catcalls, sarcastic jokes and jeers being bandied about - not just between the two main parties, as is the custom, but often within them - many of the divisions before Britain voted in June 2016 to leave the EU re-emerged. "You're a disgrace," one Conservative lawmaker yelled at another, while a Labour member of parliament openly quarreled with his colleagues in the main opposition party over which way their supporters voted in last year's referendum. Anna Soubry, a Conservative lawmaker, went on to criticize the "bullying" tactics of the Telegraph newspaper, who published the names of those politicians in May's party who voted against the government on the exact timing of Brexit. Behind the debate was the fear of pro-Brexit lawmakers that Britain may never leave the EU, and of pro-EU lawmakers who are worried Britain might crash out of the EU without a deal. The debates go to the heart of what parliament calls "one of the largest legislative projects ever undertaken in the UK", a process that could undermine May's already fragile authority. May, 61, has lost two ministers to scandals and her foreign minister, Boris Johnson, is facing calls to resign over remarks he made about a jailed Iranian-British aid worker in Iran. The Sunday Times has reported that 40 Conservatives support a no-confidence vote. May's Conservative government depends on a small Northern Irish party for its majority since a June election which dented her authority, and many lawmakers - even some Conservatives - will use the debate to increase pressure. The prime minister has tried to ease tensions by offering lawmakers some concessions on the bill before the debate began. But her moves have not yet eased everyone's concerns. One of her lawmakers, pro-EU Ken Clarke, ended his speech by saying: "I am a rebel."